The Gold Mine Finder database is a powerful tool here is some gold mine finder FAQ that will help you use it to your best advantage and provides progress of development of the software and database. ... After all, You want the edge over other prospectors, heh heh heh. NOTE - The software is not written for a MAC/APPLE/LINUX Computers, Sorry. Here is a video version of the instructions showing you how to load it to your PC. Goldmine Finder Purchase Button Temporarily Suspended From This Page. Until the Goldmine Finder program is fixed we have temporarily removed it from sale. You are licensed to use the program on two PCs, this enables you to use it on your home PC and a Laptop that you take prospecting with you. The program is a Windows Program which is not written for APPLE or MAC computers sorry. 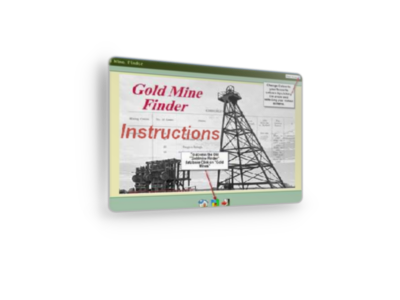 Return to Gold Prospecting home Page from gold mine finder FAQ page.